All of them are in nominative case, other cases will be different (i.e. in Genitive they will be моего́/мое́й/моего́/мои́х). So how do we determine the gender of a word? There is no reliable way. If you see this word in singular, you can usually guess by its endings or by adjectives used with it (including мой/моя/моё). Sometimes looking at suffixes helps, too. But in general, there is no reliable way. In fact, there are Russian words for which I don't know the gender! For example, in the café we have a dish called зра́зы. Since it's almost always used in plural, I don't know what's its singular form, so I don't know its gender (is it masculine зраз or feminine зраза? no idea!). In English, it is Zrazy. There should be grammar guides on the internet. You learn the basic rules (the ends of words are a pretty reliable way to determine it, it's good if the guide has dozens of examples) and then the exceptions, it's really not that difficult. And with practice with the language it becomes automatic. Waaaay more easy than in German or French, in my opinion. Where can I learn the case and gender of words? Duolingo doesn't seem to teach it well. You can use Wiktionary: https://en.wiktionary.org/wiki/тетрадь. The gender is marked in 'тетра́дь • (tetrádʹ) f inan' (f means 'feminine), the cases are listed under 'Declension of тетра́дь (inan fem-form 3rd-decl accent-a)' (you might need to click on blue the box to open it). These should really be fixed to accept Cyrillic as correct. It doesn't do much good if you can't read / write Russian in the Russian alphabet. 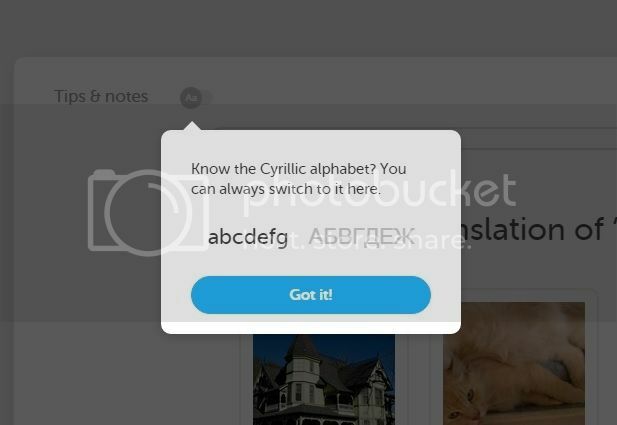 But I agree that Cyrillic should be the default option. I hadn't noticed that, thank you! there SHOULD be -- i don't se one. You’re answering a post written 2 years ago. Duolingo has done a complete rewrite of their code since this post was written, and introduced numerous changes. I have no idea how to switch the layout now. It is not especially hard to learn (with some exceptions: O that sounds like A and soft signs), but it is very time-consuming to type until one learns the keyboard. «Мой» is used with singular masculine nouns. «Мои» is used with plural nouns. Is "Мой" Pronounced as a dipthong, while "Мои" is said with a glottal stop? I don't think Russian has glottal stop. Мо́й and мои́ differ in stress, so they're easily distinguishable. As for cases when ой and ои are not distinguishable by stress (во́ины 'warriors', во́йны 'wars'), I don't know. They're often confused, but definitely distinguishable in careful speech, but I'm not sure how to describe the difference in linguistic terms. I'm pretty sure it's not a glottal stop. «Тетрадь» is feminine. Not all feminine nouns have -а or -я in the end, a number of feminine nouns ends in a soft consonant (ночь 'night', ложь 'falsehood, lies', речь 'speech'). They are declined differently from other feminine nouns (linguistically speaking, they belong to the 3rd declension/i-declension, while most other Russian feminine nouns belong to the 1st declension¹/a-declension). ¹ To make everything even more confusing, sometimes a-declension is called 2nd declension. What is the difference between тетради and поутбуки? Тетра́ди are things to write in, from which you can’t tear off pages easily. Ноутбу́ки are portable computers. There are also блокно́ты, that’s a type of notebook from which you can tear any page easily. i put тетрадь instead of тетради, but it still counted it correct, it just told me that i had a typo. can someone explain why it still accepted it? or is it just the singular and plural version of the word? Duo accepts typos if they do not result in another valid but incorrect word. They are telling you it is a typo. If it was some other form of the word that didn't apply, it would mark your answer as wrong. If you type txe when you meant to type the, Duo will probably accept it as a typo. If you type tie instead of the, Duo will reject it because it is a valid word but it is incorrect. Personally, I think a mistake is a mistake and should be treated as such. I mean if I can't spot a typo in a sentence of three or four words, then I actually made a mistake in my translation. I guess Duo thinks learning a language is hard enough for students without grading them on their typing skills. In this sentence, is тетради in the nominative case? Or genitive? Or ...?